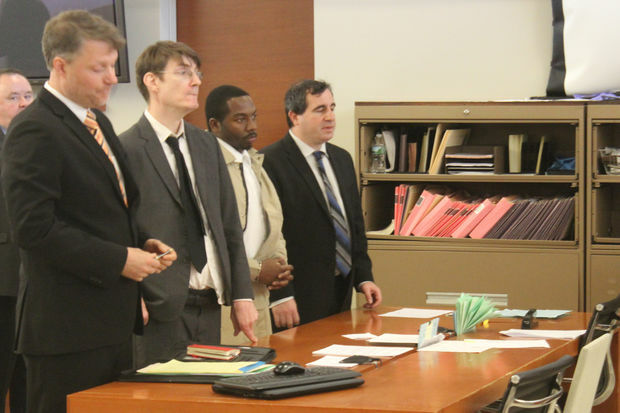 Steven Odiase (third from left) in court. THE BRONX —A man whose 2013 murder conviction was vacated in April because prosecutors withheld key evidence at trial will not face another trial, according to the Bronx District Attorney. The case against Steven Odiase, who had been serving out 25 years to life for killing 15-year-old Juan Jerez in 2009, was dismissed after the Bronx DA's office determined there was not enough evidence to prosecute him again. Odiase had been found guilty for the fatal shooting at the corner of Minerva Place and Creston Avenue, according to the Bronx District Attorney's Office. His co-defendant Daikwan Giles, who was convicted during the same trial, had confessed to the shooting and had been identified by eyewitnesses. In 2016, Odiase's attorneys asked the Bronx DA's Conviction Integrity Unit to look at his case. The review found that the defense team had received a redacted version of a detective's report. Someone had blacked out a witness description of the shooter that did not match Odiase, according to the Bronx DA's Office. One of his lawyers also said that only one eyewitness had identified Odiase, and that a subsequent interview with him "cast serious doubt on his previous trial testimony." On Wednesday, the case was dismissed and sealed by Bronx Supreme Court Justice Steven Barrett. "A lengthy and thorough investigation was conducted as to whether to retry Mr. Odiase," District Attorney Darcel Clark said in a statement. "After determining there was not enough physical evidence or witness cooperation, I decided in the interest of justice to not proceed to trial and asked the Court to dismiss and seal the case."